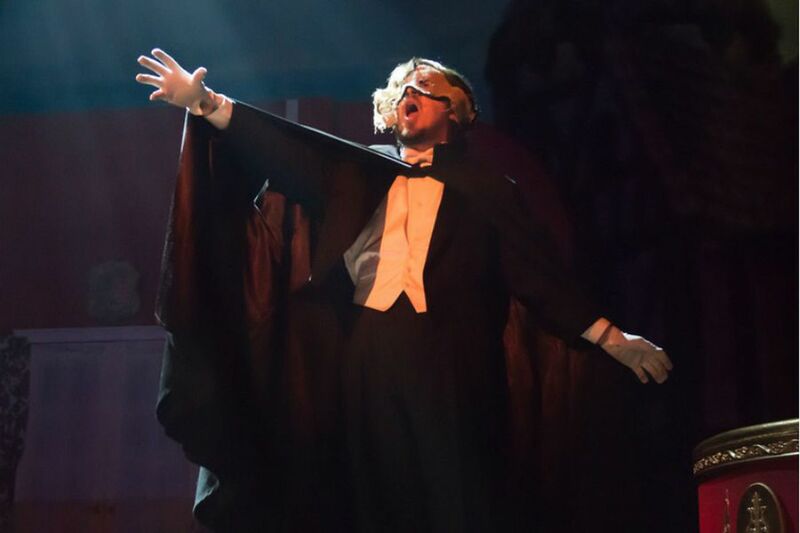 Steve McMahon as the Phantom in the world premiere of “Return of the Phantom,” running through Nov. 19 at the Broadway Theatre of Pitman. The Broadway Theatre of Pitman deserves huge kudos for creating and producing a world-premiere musical that features a cast of more than 20 and a 10-piece orchestra. It deserves even more for daring to write a sequel in story to The Phantom of the Opera, Gaston LeRoux's 1910 novel, and to Andrew Lloyd Webber's blockbuster musical of the same name. John D. Smitherman's book for this new work doesn't hinge on the musical, but it certainly builds on audience familiarity with the characters. The prologue opens in 1890, with a fire consuming the Paris Opera. Raoul (Smitherman) rescues the young soprano Christine Daae (Nicole Renna) from the lair of the Phantom (Steve McMahon). Composer Daniel Humbert's first musical contribution charms in a lovely overture that plays as we fast-forward 20 years to 1910, where the now-married Raoul and Christine, with daughter Angelique (Rachel Dalton) enjoy a home life that is filled with love yet troubled by the past. Like mother, like daughter: Angelique works as a chorus girl in the newly rebuilt Paris Opera and its first-ever production of Pagliacci. (Anyone familiar with Leoncavallo's tale of a murderous clown can guess just when the Phantom of this new work will interrupt the proceedings.) Angelique gets her big chance when the leading soprano quits. The Phantom hears her sing, but now, completely unhinged after 20 more years of solitude, he mistakes her for Christine and plans his revenge. Musically, Return of the Phantom offers much. Humbert balances his score with horn-heavy passages and soft string- and piano-driven numbers. The dark romantic lyricism reminds of Prokofiev and Richard Rodgers, and several lovely singable songs dot the 2½ hours of this production (including the remarkable "I Stand Alone"). Only two breaks mar the consistency of his composition, predicated by unwarranted comedy in the script (and a jarring reprise of a song about the butler and the maid in the style of "Master of the House" from Les Misérables). As a book, Smitherman's story doesn't have the uniformity of the original Phantom, with the overall feel of a romantic musical comedy infused with elements of British farce and police procedural. Smitherman writes punchy jokes to defuse tension or end a scene, but many distract, the soft-shoe number between a formerly inept inspector and the opera manager seems forced, and the ending contains more twists than an M. Night Shyamalan film. Director Bill Yerkes has cast fine talent in the leading roles. Renna and Dalton delight in voice, with both Christopher Manaco (as Angelique's love interest Leon) and DJ Hedgepath (as the Italian tenor Mario) adding strong performances in small roles. Smitherman's rich tenor impresses throughout the evening (Raoul's character gets most of the best songs), and McMahon's vocals left me wishing that the Phantom received more singing time. The expense of sets and costumes takes a backseat to the production, relying on Shawn McGovern's capable lighting to provide the emotional mise-en-scene. But I can't complain. Return of the Phantom stands a promising sequel to LeRoux's novel, and musically as a compelling companion piece to Webber's Broadway hit.